Well, Mary Ellen, first of all, “you guys” is really me. My partner Dan is the collector of Shaker baskets, East Coast and Midwest folk art painted on unique pieces of old wood or metal, and antique colonial earthenware jugs and crocks. As for the art glass, that’s my domain. My interest in art glass is really quite recent, as opposed to, say, my fascination with vintage board and card games, which began as a teenager, which would be more than 50 years ago. In about 2004, I was asked by two of my friends who served on the Women’s Auxiliary of the then-Evanston Northwestern Hospital in Illinois to be the Computer Chair for the American Crafts Exhibition, for which they served as Chairs of the entire weekend event. As Computer Chair, I helped with assembling the slides of various crafts for jurying — fiber wearables and art, high-end custom-made jewelry, contemporary furniture, wood and ceramic vases and bowls, and, yes, art glass pieces. There’s where it all began! My first year as Computer Chair, I walked away having purchased two contemporary art glass vases, a jar and a sculpture. The beauty of their shapes, the stunning colors within the glass, and a pamphlet of the process of glassmaking did me in, as the saying goes. Since then, I have been collecting not only fine contemporary art glass items but also gorgeous vintage ones. I won’t go into a history of art glass here, as one can readily research its humble beginnings in ancient Egypt and Syria on the Internet, but I will share with you examples of the art glass I’ve collected throughout the past decade. After acquiring a few pieces of contemporary art glass, I found an old Murano art glass jumping fish sculpture that belonged to a relative. Fascinated by its inherent shape and coloring, I decided to investigate the Murano studios and seek out more pieces to add to my collection. I’m not much into the functionality of glass stemware, but the play of colors in Murano sculptures and paperweights continues to intrigue me. The millefiori design of a special Menorah paperweight that a Jewish colleague gave me five years ago is just stunning. Because of the exquisite craftsmanship of the artisans of Murano, I’ve become a devotee. Then, there’s Depression glass, another one of my favorite art glass categories. Named for the Great Depression of the late 1920s through the 1930s, Depression glass has been connoted with functional plates, bowls, cups, butter dishes, creamers, etc., for any table setting imaginable. From crystal clear to soft rose, from grass green to dark blue, Depression glass comes in a multitude of colors. But again, it’s not the traditional kitchen and dining room dishes that I collect, as I’m more intrigue by home décor pieces that can be placed in any room. And so, that brings me to Paden City. Paden City Glass Manufacturing Company was established in 1916 at Paden City, West Virginia. The company made over twenty different colors of glass and was known throughout the Great Depression for its glass figurines. The firm sadly closed in 1951. Paden City’s most popular colors are Cheri-Glo (pink) and Ruby, and its most popular patterns include Black Forest, Peacock, and Wild Rose. 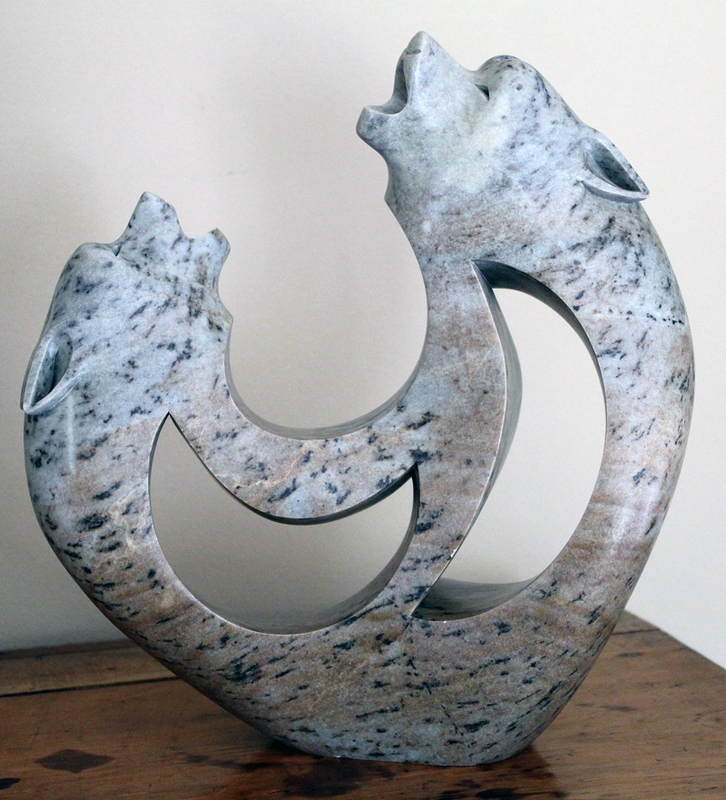 I acquired a Paden City pony sculpture, and what a delight it is! Standing almost a foot high, the pony makes quite a statement on a West Virginia gate-leg table in our foyer. What I admire about this Depression glass sculpture is the nice “sun purple” cast to the crystalline body of the pony, an occurrence commonly found in Depression glassware from the first half of the 19th century. I found an example of this very pony on page 169 of the book Glass Animals of the Depression Era by Garmon & Spencer. I continue to hunt for other rare Paden City sculptures. Prior to her death in 1973, my French grandmother gave me a heavy glass perfume bottle as a memento. Both perfume bottle and stopper were hand-blown from clear glass with turquoise flowers blown into the center of both pieces. The bottle has a few air bubbles from the glass-making process, which only adds to the dynamic glamor of the perfume bottle. I didn’t know anything about St. Clair glass at the time. After all, what teenage boy would? But I do now and enjoy collecting the company’s charming pieces. In 1888, John and Rosalie St. Clair came to the United States from the Alsace-Lorraine region of France. 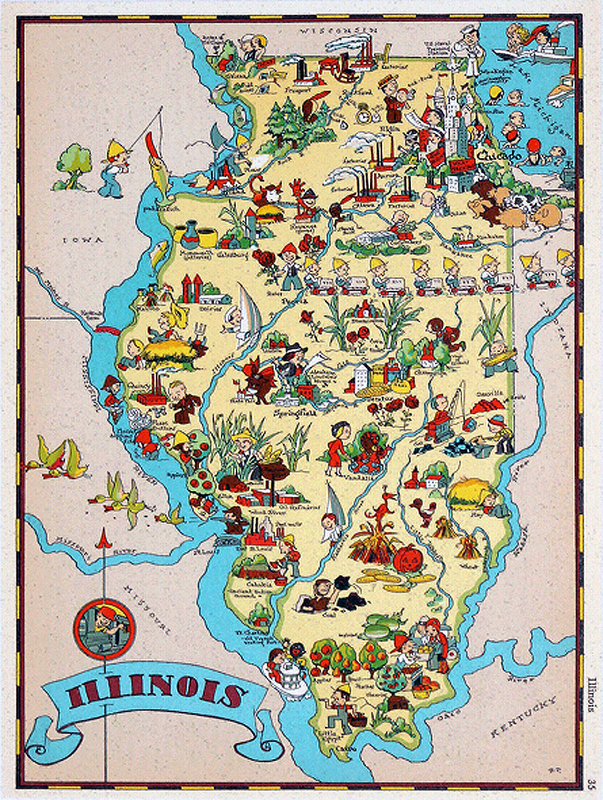 From Crystal-City, Missouri, they moved to Elwood, Indiana with their children John and Rosa. A gentleman named MacBeth Evans opened a large glass facility around the turn of the 20th century. John St. Clair and his sons went to work for Mr. Evans, developing their skills as master gaffers. In most glass manufacturing houses of that era, employees were encouraged to practice, invent, improve and create after regular working hours. John returned night after night to perfect the art that was a part of his native country’s culture. The St. Clair sons went with their father to watch and learn the techniques that have become the time-honored, intricate flower designs. Today, the descendants of John St. Clair operate the House of Glass, still producing stunning yet affordable art glass items using the Old-World glass techniques handed down to the generations of the St. Clair family. And like my grandmother before me, I enjoying going to estate sales to seek for the eye-catching art glass of the St. Clair Company. I can’t help it, but I just love glass figurines. Who’d have thought! And for me, one of the art glass studios that produces some of the most fascinating, beautifully colored, marvelously textured and, at times, humorous figurines is the Kanawha Glass Company. Kanawha Glass Company was an American art glass company that began in 1953 when a few of the artisans from the failed Dunbar Glass Company came together to start a new business. The company grew in popularity in the 1960s and it acquired Hamon Glass Company in 1969. Kanawha continued producing its line of glass products until 1987, when it was acquired by Dereume Glass. Kanawha Glass offered close to 350 different products at its peak of production. 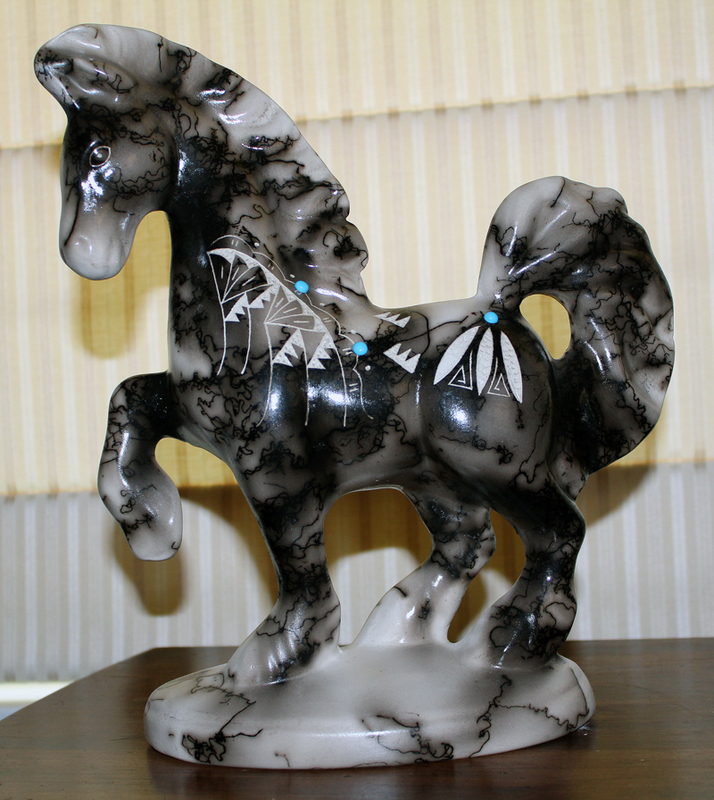 Glass horses, cats, dogs, owls and swans are among the different types of animal figurines Kanawha created. Glass bowls, with the head and neck of a swan, and owl-shaped drinking glasses are some of the more creative designs the glass artists made. Shades of blue, orange, red, amber, green, brown and white are the predominant colors used to make Kanawha glass objects. Most of the colors, except white, are transparent and sometimes combined to add interest to the designs. One of Kanawha Glass Company’s specialties was the production of crackle glass objects. To make crackle glass, molten glass is blown into a mold, then dipped into water or sawdust before refiring it to seal the cracks. The breakage rate for making crackle glass is high, sometimes as much as 50 percent. Bubble glass is another design style prevalent in Kanawha glass objects. Bubbles are deliberately formed in molten glass by adding certain chemicals or by inserting spikes. So what, in 2004, were the art glass pieces I purchase at the American Crafts Exhibition? Well, I acquired two vases and a lidded jar came from the Main Glass Studio operated by artist Steven Main. Their designs, colors, shapes, and themes simply captivated me! His profound interest in the patterns found in nature are the inspiration for Steven Main’s works. According to his website, Steven starts each art glass piece by laying out one small glass cane or rod in a mosaic-like pattern. Placed onto a sheet of heated steel, the cane design is brought closer to the temperature of the glass on the blowpipe. Steven then rolls the blowpipe across the hot steel, picking up the design onto a core of colored glass. After several layers of clear glass are gathered from the furnace, he blows out and forms the piece into its final shape. And boy, what stunning shapes and colors emerge! Of all the innumerable art glass studios that exist today, Steven Main’s studio remains one of my favorites. So, there you have it, Mary Ellen! My what and my why of the alluring art glass I collect. Please be aware that Steve and I were colleagues back in the day (that would be the 1980s) when we both worked as fantasy role-playing game editors for TSR, Inc., the then-producer of Dungeons & Dragons and its various offspring. Even though I worked for TSR, Inc., and even though I believe the company was quite innovative when it came to role-playing games, it isn’t, alas, one of my all-time favorite game companies from which to collect product. As I had to play too many diverse roles (some good, others absolutely bizarre) in my real life, I didn’t (and still don’t) need more roles to play during my leisure moments. That said, here are my four favorite games companies and some of the games they have created, manufactured, and distributed throughout the years. 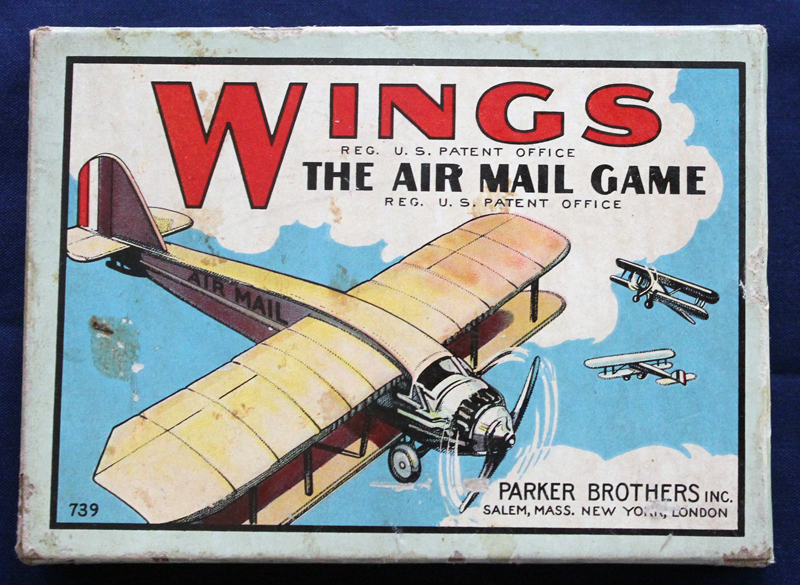 Since 1883, Parker Brothers has published more than 1,800 games. 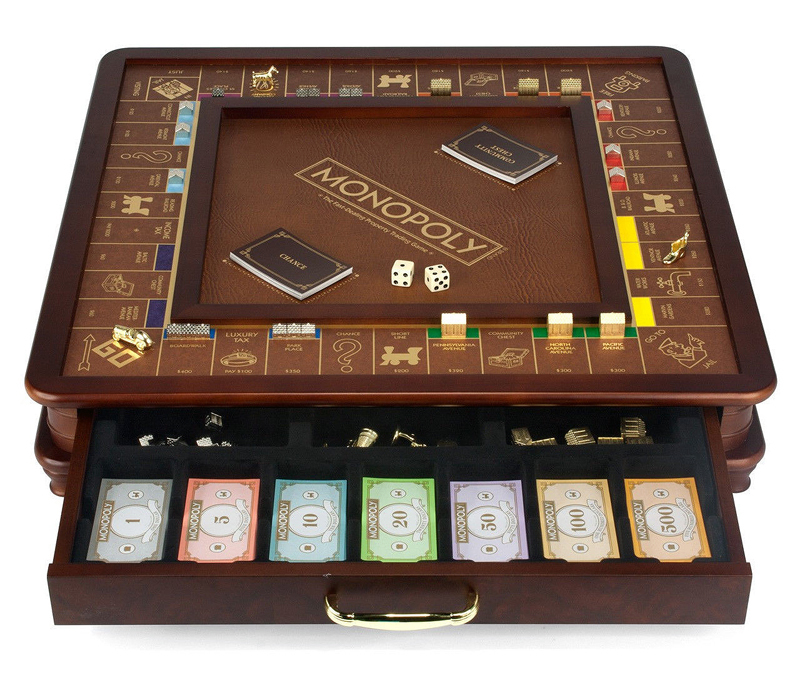 Among its best-known products are Monopoly, Sorry!, Risk, Trivial Pursuit, Ouija, and Probe. Of these, I would say that the finance-based, land baron game of Monopoly, which originated and gained in popularity during the Great Depression, has been the most enduring game ever produced during the Industrial Era and continues to sell well in this new millennium. It is the perennial favorite of board games and it is the most mimicked and reproduced game of the last century. If you doubt this, just go to the Internet and check out CafePress or CustomopolyGames. The royalties on this game’s patent most be enormous and blissfully ironic considering the board game’s financial focus. For a bit of history, Parker Brothers was founded in Salem, Massachusetts by George S. Parker, whose philosophy deviated from the prevalent theme of board game design. George Parker believed that games should be played for enjoyment and did not need to emphasize morals and values. Hence, it is no surprise that he created his first game, Banking (in 1883 at the age of 16), which allowed players to borrow money from the bank and try to generate wealth by guessing how well they could do. There you go — there’s a little bit of the gambler or the hedge man in each of us, even when we play games! 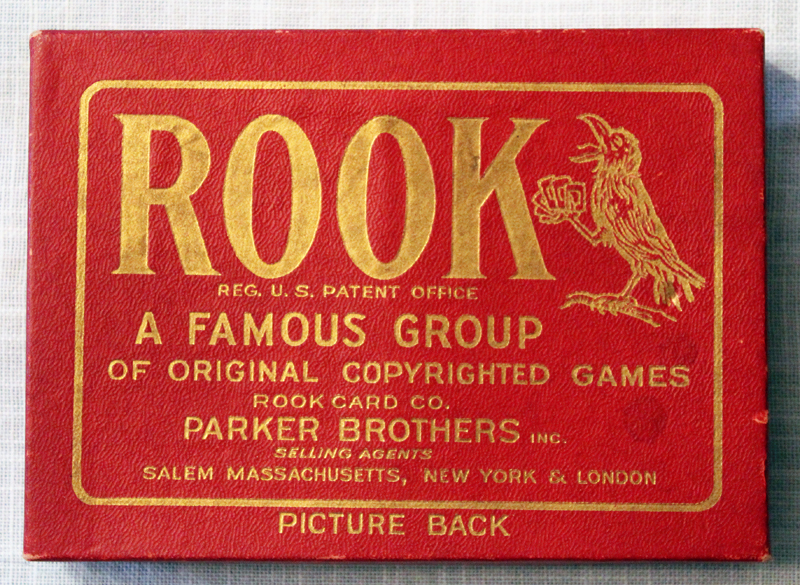 In 1906, Parker Brothers published the game Rook, its most successful card game to this day, and it quickly became the best-selling game in the country. From the 1930s on, the company continued its phenomenal growth, producing such long-lasting popular board games as the murder mystery challenge of Clue, the military conquest inherent in Risk, and the family entertainment factor of Sorry! In 1991. Hasbro acquired the rights of all Parker Brothers games and has, since 2013, phased out all references to Parker Brothers on its games. Too bad, in my opinion, Hasbro just doesn’t possess the same notable name recognition value or inventiveness of George Parker and his brothers. Just in case you didn’t know, the Milton Bradley Company was established as a game company in Springfield, Massachusetts in 1860 by Milton Bradley. In 1920, the company absorbed the game production of McLoughlin Brothers, formerly the largest game manufacturer in the United States; and, in 1987, it purchased Selchow and Righter, the makers of Parcheesi and Scrabble. Just like its arch-rival of many years, Parker Brothers, Milton Bradley was taken over by Hasbro, Inc., in 1984. 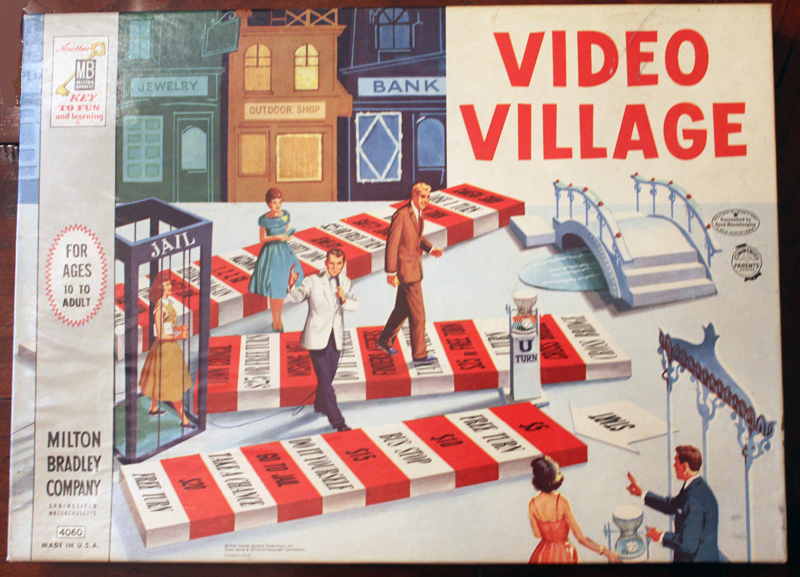 Regardless of its ultimate fate, The Milton Bradley Company was excellent at pursuing television production companies to acquire the titles of many television shows of the 1950s and 1960s that had name recognition for and were endearing to those of us who grew up as part of the “Baby Boom Generation.” But, in truth, Milton Bradley was a board game designer who made his money by making games that people enjoyed playing. Thus, when television became the technological marvel of the mid-20th century, Bradley’s design philosophy extended to the products of that medium. 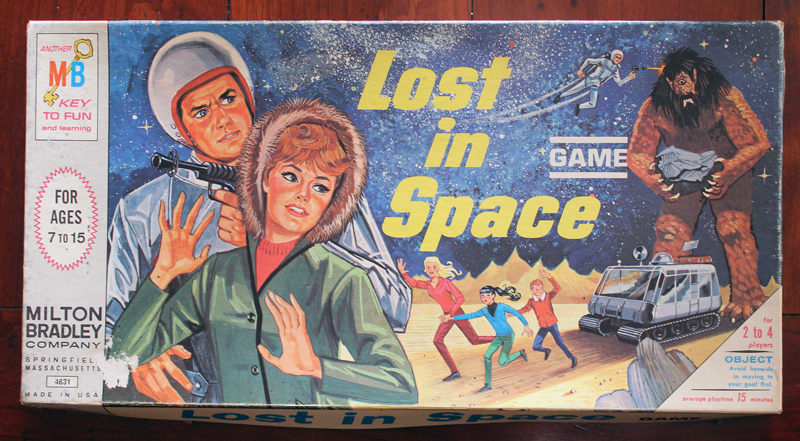 The list of television-based board or card games produced by The Milton Bradley Company is exhaustive, and just looking at what we have on sale at Dogbotz Boneyard, the list includes Annie Oakley, Captain Kangaroo, Charlie Brown, Johnny Quest, Lost in Space, Sergeant Preston, Video Village, Voyage to the Bottom of the Sea and Yogi Bear. 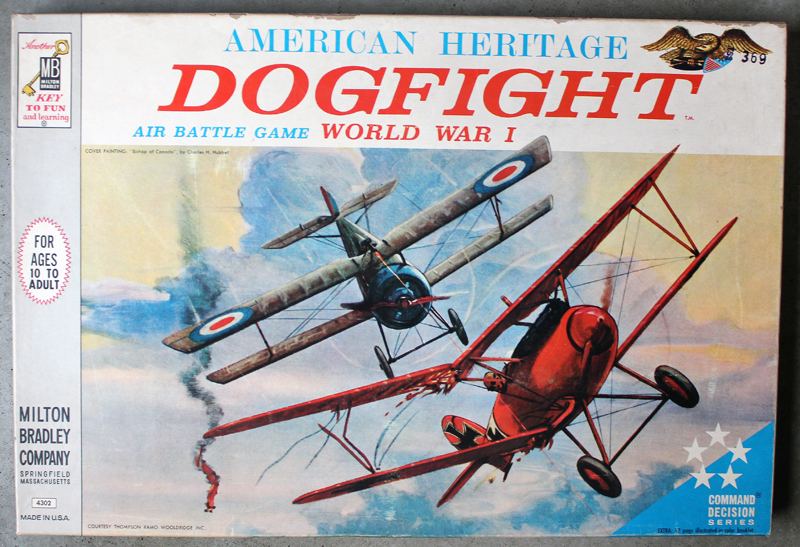 Of course, beyond the realm of television shows or Saturday morning cartoons, The Milton Bradley Company is also well known for some of its perennial family games such as Candy Land, Game of the States and Rack-o, not to mention its revered American Heritage set of four military history games: Broadside, Civil War, Dogfight and Hit the Beach. Despite its acquisition by Hasbro, Inc., the Milton Bradley name has become synonymous with a game manufacturer that continues to turn out games that capitalized on current trends. As I approach my sixth decade of life, I remember that, as a kid growing up from the mid-1950s to the early 1970s, we had no such entertainment venues as video or online games. Yup, if my brother and I weren’t out riding our bicycles, playing sports, or having our G.I. Joes attack the prim-and-proper Ken dolls (our arch-rivals for Barbie’s affections) of our neighbor Holly Householder or other such prepubescent playtime activities, we were indoors, playing games. 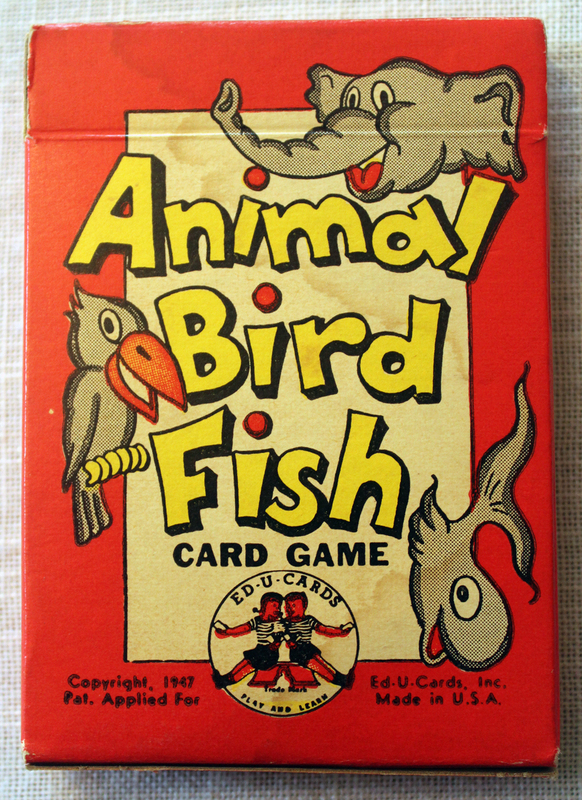 And, our favorites were produced by one of the nation’s most well-regarded educational game companies, Ed-U-Cards Manufacturing Corporation. 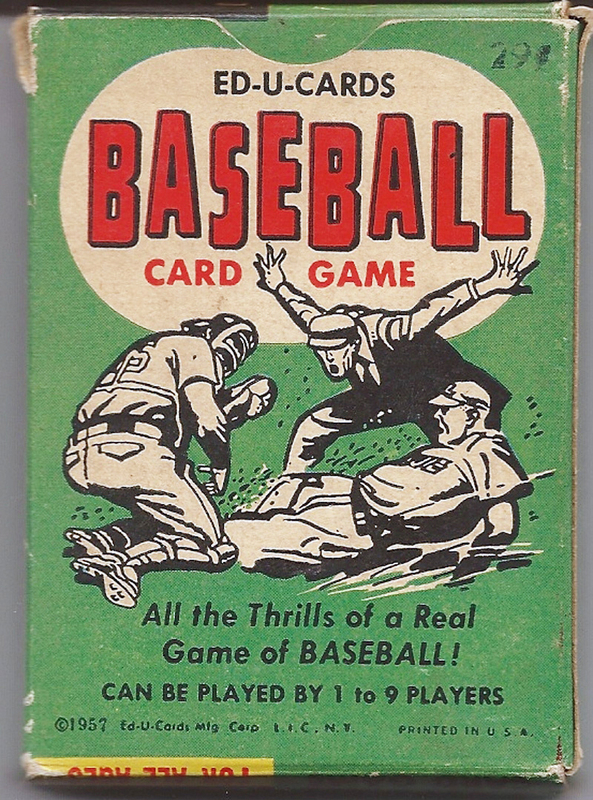 The Ed-U-Cards Manufacturing Corporation was originally located in Long Island City, New York and began operations in 1946 as a manufacturer of educational flash cards and card games. The late 1940s was an ideal time to start a new publishing company, as the paper rationing of World War II had recently ended. Many new magazines, local newspapers, catalogs, and other paper products started then, as the paper mills suddenly had lots of paper available, and that meant low prices. 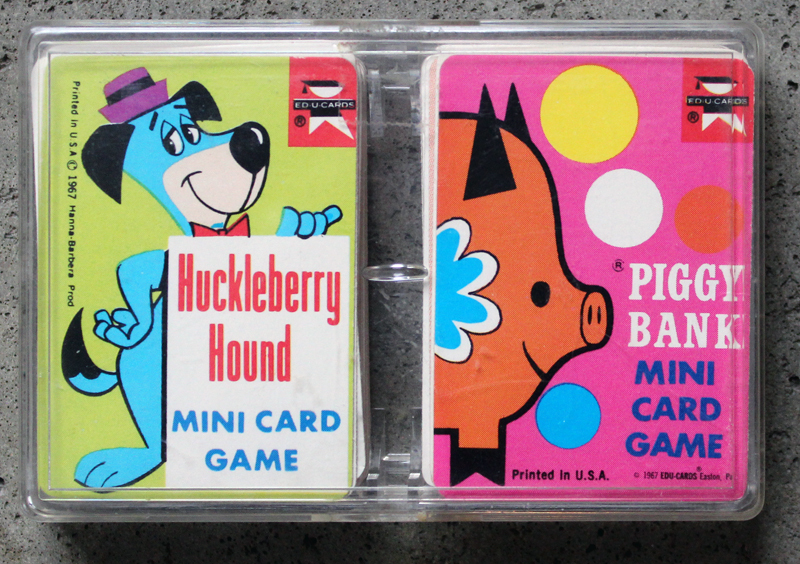 Though Ed-U-Cards did produce cards for sheer entertainment value, such as its popular series of card games based on children’s televised cartoon shows like Huckleberry Hound, Quick Draw McGraw, Yogi Bear and The Flintstones, it most distinguished products were its educational games. 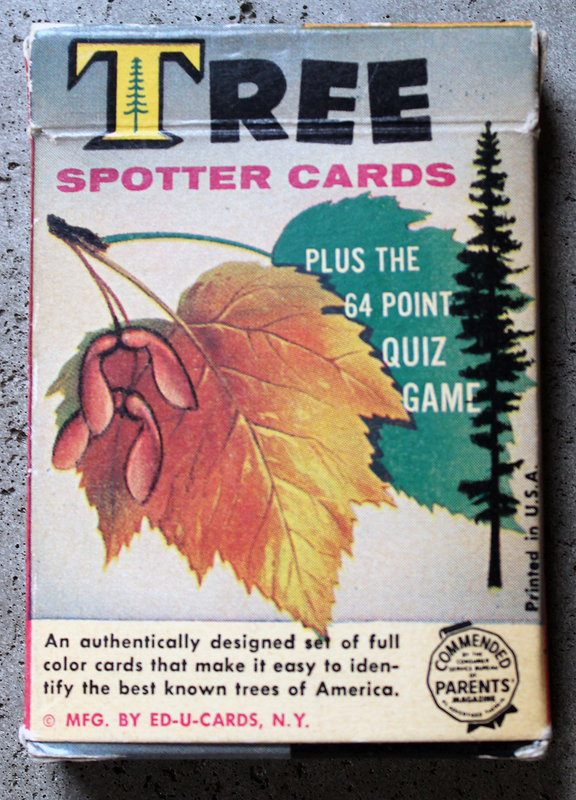 Some of these were flash-card type games (for example, Tree Spotter Cards and Bible Story Cards), some focused on the fundamentals of language arts or mathematics (ABC Educational Cards and Animal, Bird, Fish Card Game come readily to mind), and others taught the basic of science or sports (Ed-U-Cards’ 1957 Baseball Card Game and, from the same year, Space Race Card Game are notable examples). Whatever games the company produced, these products were highly regarded and valued by us Boomer children as well as our parents and teachers. Sadly, I could find no references to Ed-U-Cards Manufacturing Corporation beyond 1984. Nonetheless, the impact of the high-quality educational and entertainment games this firm produced lives on, for, in fact, today the industry term ed-u games refers to the production of the most visionary and enjoyable educational game products possible. As a collector and seller of antique and vintage games, I also like to contemplate what contemporary board and card games might become long-lasting and noteworthy collectibles in the future. Though TSR, Inc., and its products might have been part of my favorites list, if there’s anything that I perceive as truly collectible about these games and their by-products, it’s their stunning color artwork. So, that’s why, for example, I have a Larry Elmore painting hanging in my home as part of my larger art collection (but science fiction and fantasy artwork is a topic for a future blog). Afterward, I considered the collectible card games produced by Wizards of the Coast, particularly Magic: The Gathering and its ilk. Yet, though they present intriguing content and game mechanics, these games struck me as a passing fad, albeit a huge revenue-generating one for its parent company. No, I sought something more enduring, perhaps even of solid educational value such as the diverse games produced by Ed-U-Cards during my youth. And so, as I reviewed contemporary game companies and their products, the one that came immediately to mind was Outset Media Corporation, makers of the now-popular Professor Noggin’s series of educational card games, the first of which was produced in 2002. Founded in 1996 by 23-year-old university student David Manga, Outset Media Corporation is a Canadian company that develops and distributes family entertainment products, specializing in board games, party games, card games, and jigsaw puzzles. The company was originally incorporated for the sole purpose of publishing and distributing a single board game called All Canadian Trivia, which was released in May 1997 and became a Canadian bestseller with more than 100,000 copies sold in Canada alone. Then in 2002, a children’s educational card game phenomenon that featured the fictional instructor Professor Noggin was produced. 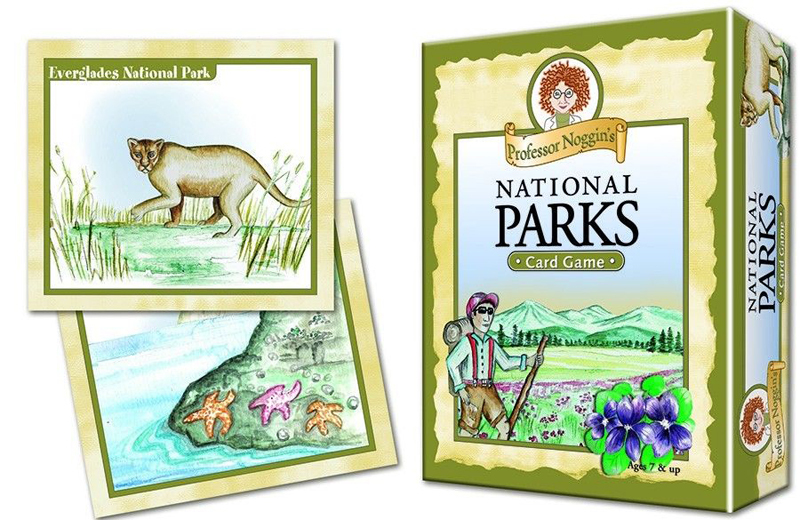 Today, 39 different titles form part of the Professor Noggin’s series of card games, and over 800,000 copies have been sold worldwide. 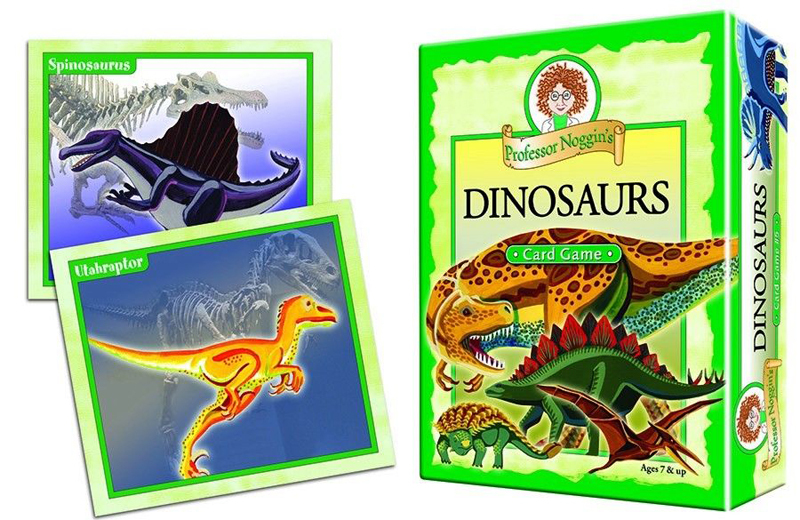 In addition, the series has garnered 14 international toy and game awards to date, and this acclaim is due to the fact that each card game in the series encourages children to learn interesting facts about their favorite subjects. Each game of 30 cards combines trivia, true-false, and multiple-choice questions. Each card set includes a special 3-numbered die to create interaction and promote communication between players. Easy and hard levels of testing knowledge keep children interested and challenged while having fun. 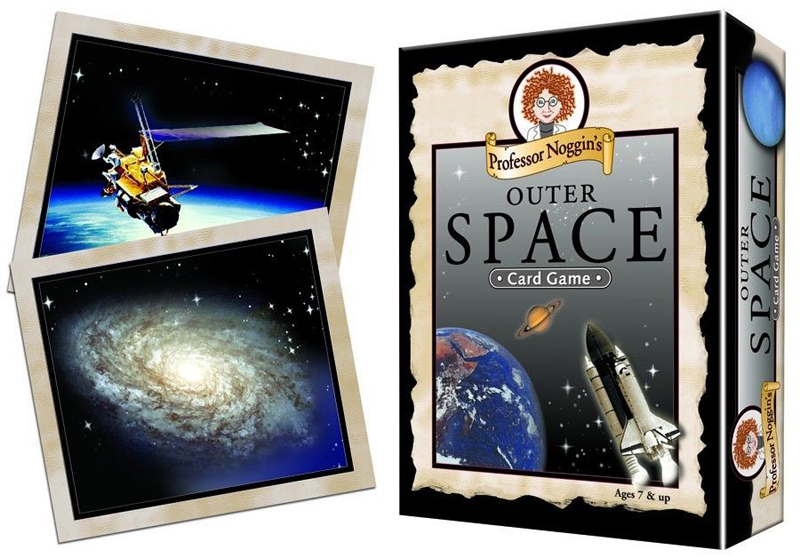 Try out one of the Professor Noggin’s card games with your children or even adult family members and friends, and you’ll see why I’ve add Outset Media Corporation to my list of all-time favorite game companies. Now it’s your turn! Tell me what game companies are your favorites, and why! 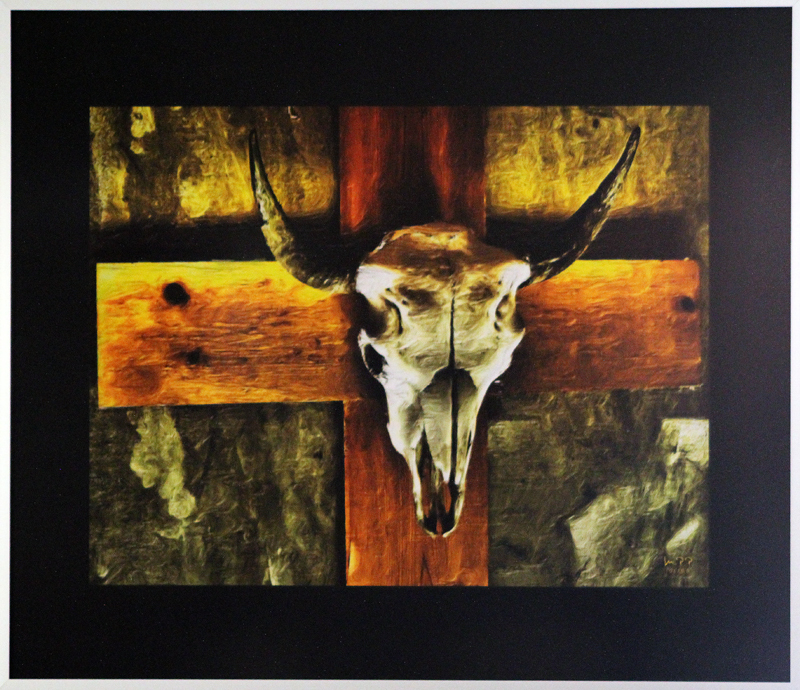 Print Methodologies: Modes for Artistic Masterpieces or Mechanistic Atrocities? 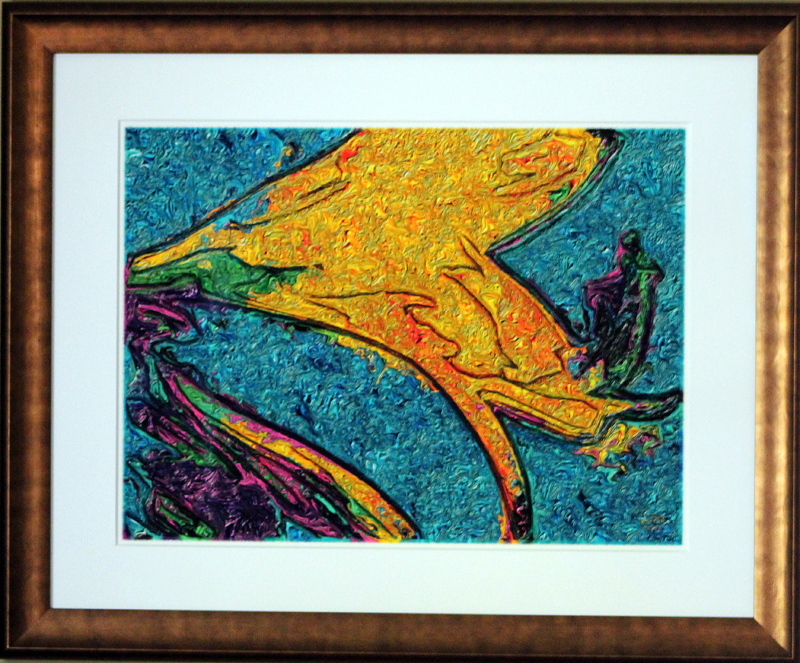 In a recent e-mail, one of our regular customers was curious about the different methods of printmaking that has led to some really beautiful artwork available through Dogbotz Boneyard. “When I think of prints, I am usually thinking about photography: black-and-white prints, color prints, sepia tones, etc.,” Justin writes to us. “And yet, I know there are woodblock prints, stone prints and more. Could you detail some of these for me, using samples of art you sell at the Dogbotz Boneyard Gallery of Art?” Well, Justin, let’s begin with some basic concepts: etching, engraving and screening techniques. Intaglio is the family of printing and techniques in which the image is incised into a surface, and the incised line or sunken area holds the ink. It is the direct opposite of a relief print. Normally, copper or zine plates are used as a surface or matrix, and the incisions are created by etching, engraving, drypoint, aquatint or mezzotint. Collagraphs may also be printed as intaglio plates. In the form of intaglio printing called etching, the plate is covered in a resin ground or an acid-resistant wax material. Using an etching needle, or a similar tool, the image is engraved into the ground, revealing the plate underneath. The plate is then dipped into acid. The acid bites into the surface of the plate where it was exposed. Biting is a printmaking term to describe the acid’s etching, or incising, of the image. After the plate is sufficiently bitten, the plate is removed from the acid bath, and the ground is removed to prepare for the next step in printing. To print an intaglio plate, ink is applied to the surface by wiping and/or dabbing the plate to push the ink into the bitten grooves. The plate is then rubbed with tarlatan cloth to remove most of the excess ink. The final smooth wipe is often done with newspaper or old public phone book pages, leaving ink only in the incisions. A damp piece of paper is placed on top of the plate, so that when going through the press the damp paper will be able to be squeezed into the plate’s ink-filled grooves. The paper and plate are then covered by a thick blanket to ensure even pressure when going through the rolling press. The rolling press applies very high pressure through the blanket to push the paper into the grooves on the plate. The blanket is then lifted, revealing the paper and printed image. Intaglio engraving, as a method of making prints, was invented in Germany by the 1430s, well after the woodcut print. Engraving had been used by goldsmiths to decorate metalwork, including armor, musical instruments and religious objects since ancient times, and the niello technique, which involved rubbing an alloy into the lines to give a contrasting color, also goes back to late antiquity. It has been suggested by art historians that goldsmiths began to print impressions of their work to record the design, and that printmaking developed from that. Martin Schongauer was one of the earliest known artists to exploit the copper-engraving technique, and Albrecht Dürer is one of the most famous intaglio artists. Italian and Netherlandish engraving began slightly after the Germans, but were well developed by 1500. Drypoint and etching were also German inventions of the 15th century, probably by the Housebook Master and Daniel Hopfer, respectively. The golden age of engraving by artists was 1450–1550, after which the technique lost ground to etching as a medium for artists, although engravings continued to be produced in huge numbers until after the invention of photography. Today intaglio engraving is largely used for currency, banknotes, passports and occasionally for high-value postage stamps. The appearance of engraving is sometimes mimicked for items such as wedding invitations by producing an embossment around lettering printed by another process (such as lithography or offset) to suggest the edges of an engraving plate. Lithography (from Greek lithos, “stone” and graphein, “to write”) is a method for printing using a stone (lithographic limestone) or a metal plate with a completely smooth surface. Invented in 1796 by German author and actor Alois Senefelder as a cheap method of publishing theatrical works, lithography can be used to print text onto paper or other suitable material. Lithography originally used an image drawn (etched) into a coating of wax or an oily substance applied to a plate of lithographic stone as the medium to transfer ink to a blank paper sheet, and so produce a printed page. In modern lithography, the image is made of a polymer coating applied to a flexible aluminum plate. To print an image lithographically, the flat surface of the stone plate is roughened slightly — etched — and divided into hydrophilic regions that accept a film of water, and thereby repel the greasy ink; and hydrophobic regions that repel water and accept ink because the surface tension is greater on the greasy image area, which remains dry. The image can be printed directly from the plate (the orientation of the image is reversed), or it can be offset, by transferring the image onto a flexible sheet (rubber) for printing and publication. During the first years of the 19th century, lithography had only a limited effect on printmaking, mainly because technical difficulties remained to be overcome. Germany was the main center of production in this period. Godefroy Engelmann, who moved his press from Mulhouse to Paris in 1816, largely succeeded in resolving the technical problems, and during the 1820s lithography was adopted by artists such as Delacroix and Géricault. London also became a center, and some of Géricault’s prints were in fact produced there. The Spanish painter Goya in Bordeaux produced his last series of prints by lithography — The Bulls of Bordeaux of 1828. By the mid-century the initial enthusiasm had somewhat diminished in both countries, although the use of lithography was increasingly favored for commercial applications, which included the prints of Daumier, published in newspapers. Rodolphe Bresdin and Jean-François Millet also continued to practice the medium in France, and Adolf Menzel in Germany. In 1862 the publisher Cadart tried to initiate a portfolio of lithographs by various artists which was not successful but included several prints by Manet. The revival began during the 1870s, especially in France with artists such as Odilon Redon, Henri Fantin-Latour and Degas producing much of their work in this manner. The need for strictly limited editions to maintain the price had now been realized, and the medium became more accepted. In the 1890s, color lithography became popular with French artists, Toulouse-Lautrec most notably of all, and by 1900 the medium in both color and monotone was an accepted part of printmaking, although France and the United States have used it more than other countries. During the 20th century, a group of artists, including Braque, Calder, Chagall, Dufy, Léger, Matisse, Miró, and Picasso, rediscovered the largely undeveloped art form of lithography thanks to the Mourlot Studios, also known as Atelier Mourlot, a Parisian print shop founded in 1852 by the Mourlot family. The Atelier Mourlot originally specialized in the printing of wallpaper; but it was transformed when the founder’s grandson, Fernand Mourlot, invited a number of 20th-century artists to explore the complexities of fine art printing. Mourlot encouraged the painters to work directly on lithographic stones in order to create original artworks that could then be executed under the direction of master printers in small editions. The combination of modern artist and master printer resulted in lithographs which were used as posters to promote the artist’ work. Chromolithography is a method for making multi-color prints. This type of color printing stemmed from the process of lithography, and it includes all types of lithography that are printed in color. When chromolithography is used to reproduce photographs, the term photochrom is frequently used. Lithographers sought to find a way to print on flat surfaces with the use of chemicals instead of relief or intaglio printing. Chromolithography became the most successful of several methods of color printing developed by the 19th century; other methods were developed by printers such as Jacob Christoph Le Blon, George Baxter and Edmund Evans, and mostly relied on using several woodblocks with the colors. Hand-coloring also remained important; elements of the official British Ordnance Survey maps were colored by hand by boys until 1875. The initial technique involved the use of multiple lithographic stones, one for each color, and was still extremely expensive when done for the best quality results. Depending on the number of colors present, a chromolithograph could take months to produce, by very skilled workers. However much cheaper prints could be produced by simplifying both the number of colors used, and the refinement of the detail in the image. Cheaper images, like advertisements, relied heavily on an initial black print (not always a lithograph), on which colors were then overprinted. 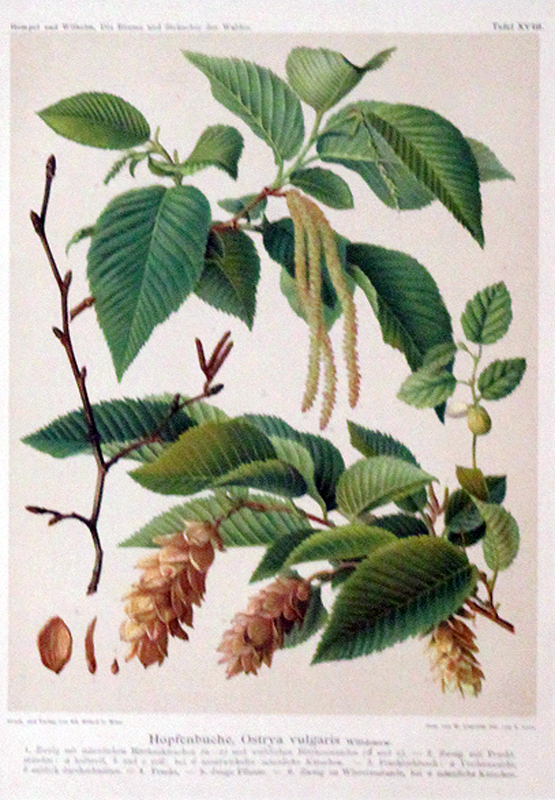 To make an expensive reproduction print as what was once referred to as a chromo, a lithographer, with a finished painting in front of him, gradually created and corrected the many stones using proofs to look as much as possible like the painting in front of him, sometimes using dozens of layers. Alois Senefelder, the inventor of lithography, introduced the subject of colored lithography in his 1818 Vollstaendiges Lehrbuch der Steindruckerey (translated as A Complete Course of Lithography), where he told of his plans to print using color and explained the colors he wished to be able to print someday. Although Senefelder recorded plans for chromolithography, printers in other countries, such as France and England, were also trying to find a new way to print in color. Godefroy Engelmann of Mulhouse in France was awarded a patent on chromolithography in July 1837, but there are disputes over whether chromolithography was already in use before this date, as some sources say, pointing to areas of printing such as the production of playing cards. The first American chromolithograph — a portrait of Reverend F. W. P. Greenwood — was created by William Sharp in 1840. Many of the chromolithographs were created and purchased in urban areas. The paintings were initially used as decoration in American parlors as well as for decoration within middle-class homes. They were prominent after the Civil War because of their low production costs and ability to be mass-produced, and because the methods allowed pictures to look more like hand-painted oil paintings. Production costs were only low if the chromolithographs were cheaply produced, but top-quality chromos were costly to produce because of the necessary months of work and the thousands of dollars worth of equipment that had to be used. Although chromos could be mass-produced, it took about three months to draw colors onto the stones and another five months to print a thousand copies. Chromolithographs became so popular in American culture that the era has been labeled as “chromo civilization”. Over time, during the Victorian era, chromolithographs populated children’s and fine arts publications, as well as advertising art, in trade cards, labels, and posters. They were also once used for advertisements, popular prints, and medical or scientific books. Even though chromolithographs served many uses within society at the time, many were opposed to the idea of them because of their lack of authenticity. 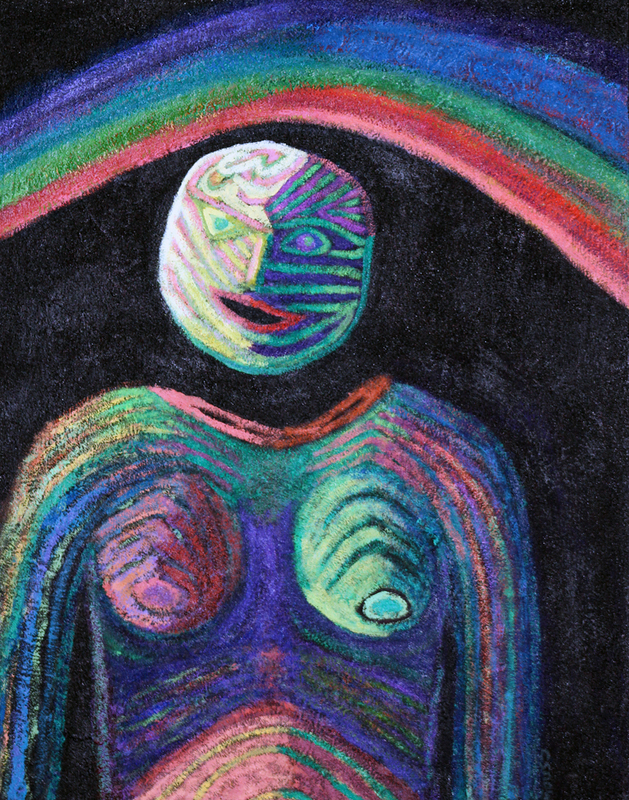 The new forms of art were sometimes tagged as “bad art” because of their deceptive qualities. Some also felt that it could not serve as a form of art at all since it was too mechanical, and that the true spirit of a painter could never be captured in a printed version of a work. Over time, chromos were made so cheaply that they could no longer be confused with original paintings. Since production costs were low, the fabrication of chromolithographs became more a business than the creation of art. Screen printing is a printing technique that uses a woven mesh to support an ink-blocking stencil. The attached stencil forms open areas of mesh that transfer ink or other printable materials that can be pressed through the mesh as a sharp-edged image onto a substrate. A fill blade or squeegee is moved across the screen stencil, forcing or pumping ink into the mesh openings for transfer by capillary action during the squeegee stroke. Basically, it is the process of using a stencil to apply ink onto another material. Screen printing is also a stencil method of print making in which a design is imposed on a screen of polyester or other fine mesh, with blank areas coated with an impermeable substance. Ink is forced into the mesh openings by the fill blade and onto the printing surface during the squeegee stroke. It is also known as silkscreening, serigraphy, and serigraph printing. A number of screens can be used to produce a multicolored image. Screen printing is a form of stenciling that first appeared in a recognizable form in China during the Song Dynasty (960–1279 ad). It was then adapted by other Asian countries like Japan, and was furthered by creating newer methods. Screen printing was largely introduced to Western Europe from Asia sometime in the late 18th century, but did not gain large acceptance or use in Europe until silk mesh was more available for trade from the east and a profitable outlet for the medium discovered. Early in the 1910s, several printers experimenting with photo-reactive chemicals used the well-known actinic light activated cross linking or hardening traits of potassium, sodium or ammonium chromate and dichromate chemicals with glues and gelatin compounds. Roy Beck, Charles Peter and Edward Owens studied and experimented with chromic acid salt sensitized emulsions for photo-reactive stencils. This trio of developers would prove to revolutionize the commercial screen printing industry by introducing photo-imaged stencils to the industry, though the acceptance of this method would take many years. Commercial screen printing now uses sensitizers far safer and less toxic than dichromates. Currently, there are large selections of pre-sensitized and “user mixed” sensitized emulsion chemicals for creating photo-reactive stencils. Credit is generally given to the artist Andy Warhol for popularizing screen printing identified as serigraphy in the United States. Warhol is particularly identified with his 1962 depiction of actress Marilyn Monroe screen printed in garish colors. The wonderful examples of lithographs, chromolithographs, and serigraphs displayed throughout this blog are available for sale at the the Dogbotz Boneyard Gallery of Art. My good friend Delores loves shopping at Dogbotz Boneyard as she has been a collector of costume jewelry for a few years now. While chatting last week, Delores asked me about the use of plastic in vintage costume jewelry as she had recently discovered Bakelite, both in its colorful beauty and in its investment value. “So, Patrick, tell me about plastics,” Delores insisted, so here’s what I shared with her. As there were three musical Andrews Sisters (Patty, Maxine, and LaVerne) who were established singers and radio personalities throughout the 1940s and 50s, so, too, were there three plastics that made costume jewelry quite eye-catching and, today, often expensive. These renowned “plastic sisters” are Celluloid, Bakelite and Lucite. Dating from the beginning of the 20th century to the 1930s, Celluloid is one of the earliest man-made plastics widely used in costume jewelry. Celluloid has certain characteristics that differentiate it from other plastics. In general, pieces made from Celluloid tend to be thin, light, somewhat brittle, sensitive to heat (they crack and craze), and early Celluloid can be extremely flammable (do not ever test with a hot pin!). Celluloid is flexible. It can be bent, twisted, and molded. When placed briefly in hot water, early Celluloid smells like camphor, while later cellulose acetate smells like vinegar. Celluloid jewelry should be stored carefully. Extremes of temperature, moisture, exposure to cosmetics or perfume, or lack of adequate ventilation can cause a Celluloid piece to begin to discolor, crack, or even disintegrate. A piece of Celluloid jewelry so afflicted is contagious to other Celluloid pieces; thus, it should be segregated from other Celluloid jewelry. Developed by Dr. Leo H. Baekeland and patented in 1909, Bakelite was the first thermosetting phenol formaldehyde resin. Other companies produced similar phenolics, calling their products Catalin, Prystal, Marblette, and Durez, but since it is almost impossible to identify pieces by their manufacturers, phenolics in general are commonly referred to as Bakelite. A very wide range of items were produced from Bakelite, including billiard balls, telephones, radios, kitchen utensils, poker chips, and, of course, jewelry. Bakelite’s unique characteristic is that once it has been heated and formed, it can neither be re-melted nor re-formed. It can be cast, laminated, inlaid, carved, and tinted almost any color of the rainbow. Bakelite colors, however, do change with age. Most pieces that collectors identify as apple-juice yellow were originally colorless, and white Bakelite mellows to a creamy ivory color. 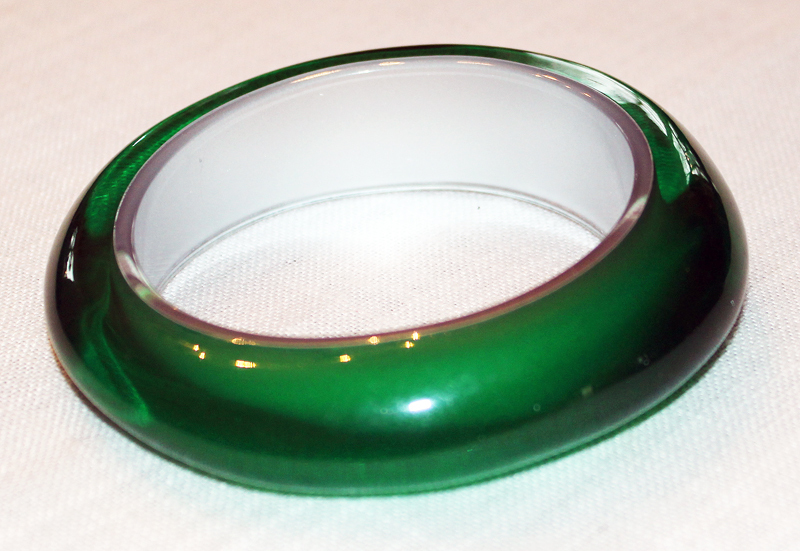 Bakelite can be transparent, translucent or opaque. Bakelite tends to be heavy. When two pieces are tapped together they make a distinctive deep clack, as opposed to the high-pitched click of later plastics. 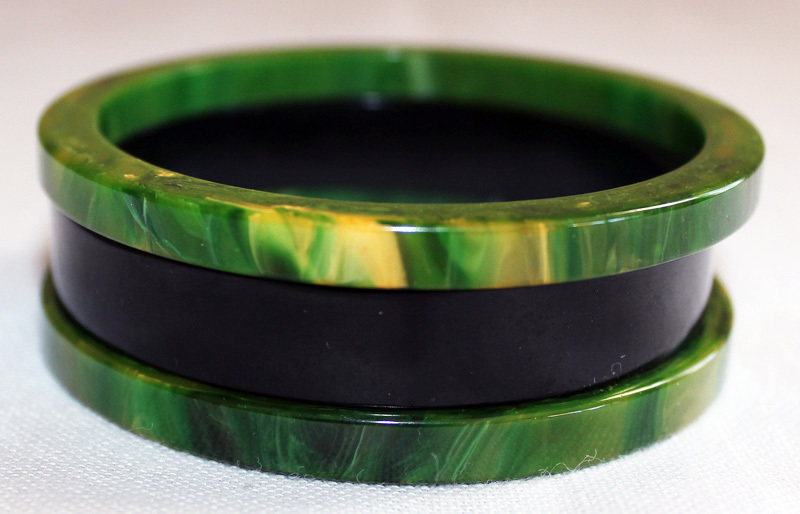 Bakelite jewelry develops a surface patina over time. The surface color tends to darken, and very fine pits and scratches are produced with wear. A nice patina enhances the value of a piece of Bakelite jewelry. When placed briefly in hot water, most but not all Bakelite has a unique and unforgettable carbolic acid smell. Bakelite should be stored carefully, although it is not as fragile as Celluloid. Lucite, an acrylic resin, was first marketed by DuPont in 1937, and it began to appear in costume jewelry around 1940. 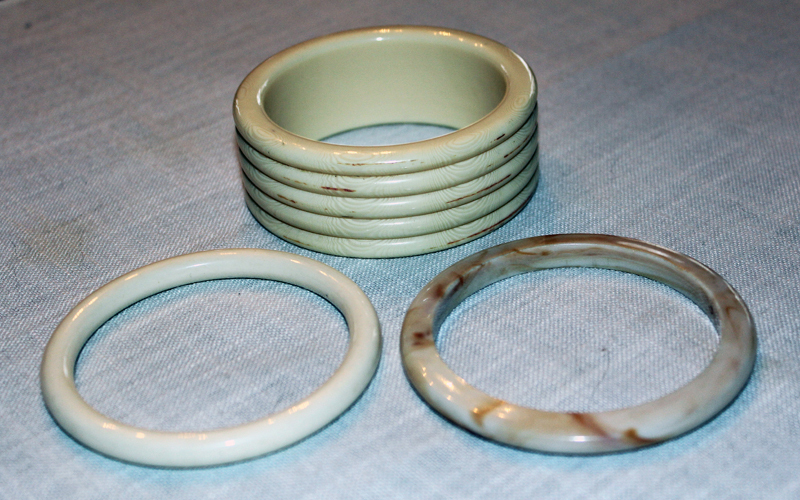 As with Bakelite, Lucite is a thermoset plastic, but it was much cheaper to produce. 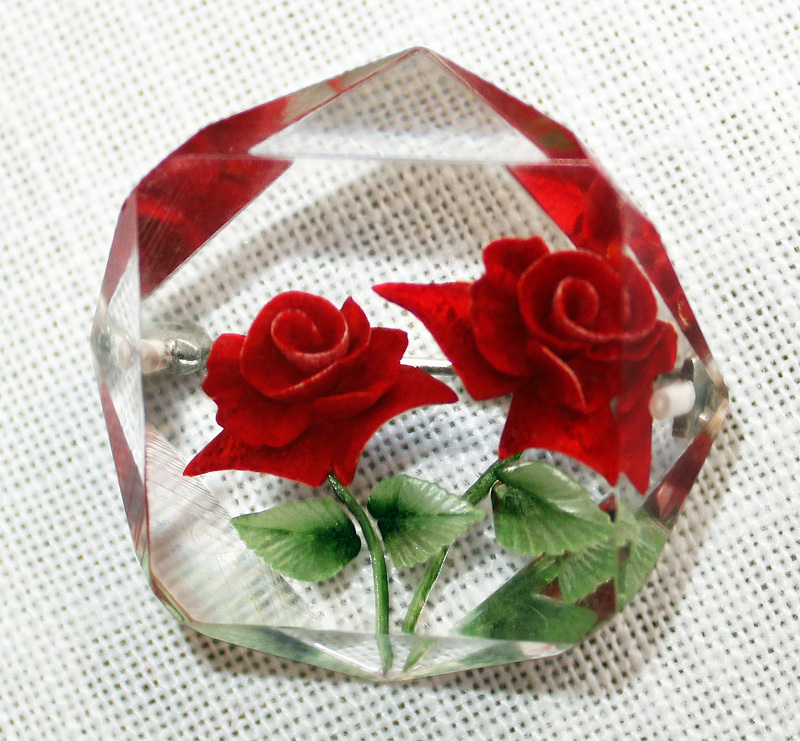 Lucite could be molded, cast, laminated, inlaid, and carved. Although clear and colorless in its original state, it could be tinted any color of the rainbow, from transparent to opaque. Lucite continues to be used in jewelry manufacture, but it reached its height of popularity in the 1940s and 50s. Common post-war pieces of interest to collectors include clear Lucite embedded with glitter, seashells, rhinestones, or flowers. When placed briefly in hot water, Lucite is odorless. Older Lucite can develop cracks from age or exposure to heat. Wishing to shift her status from novice to aficionado of plastics in costume jewelry, Delores probe me for more information. “Patrick, how can I tell whether I have the real thing, that my moss-colored bangle is truly made of Bakelite?” she inquired. So, I offered her three standard tests that collectors use to determine authenticity. Assuming that the plastic piece of jewelry does not include string, wood, hand-painted decoration, or other non-plastic decorative materials, one can hold an edge of the piece under hot running tap water for up to 30 seconds and then smell it. Bakelite has a characteristic Phenol or fresh shellac odor. No odor probably means that the piece is Lucite. Formula 409®, the all-purpose cleaner manufactured by The Clorox Company, is a good testing agent. One should test a small area of the plastic jewelry piece, preferably on the reverse of a pin or the inside of a bracelet, by putting a small amount of Formula 409 on a cotton swab and rubbing it on the test area for a few seconds. If the swab develops a yellowish residue, regardless of the original color of the plastic, then most likely the piece is Bakelite. The tester should be sure to wash the test area immediately afterwards with mild dishwashing soap and warm water and towel dry immediately afterward. Formula 409 is a superior testing agent is it does not strip the plastic finish of the jewelry. Simichrome Polish is available at one’s local hardware store. It is expensive, but well worth the investment of one, like Delores, intends to become a collector of plastic costume jewelry. Simichrome is a superior Bakelite polishing product, and it does a wonderful job on silver and other metals, too. 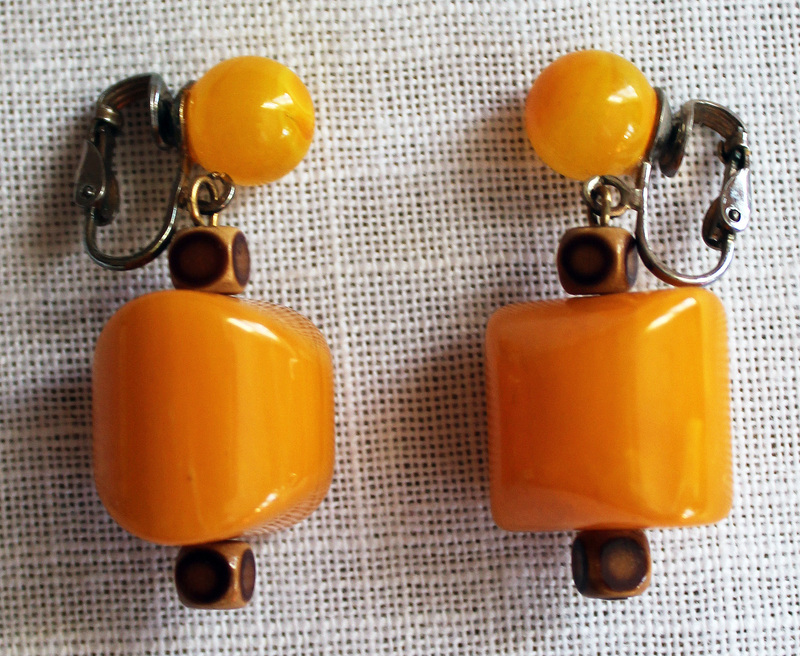 When polished with Simichrome, Bakelite will often leave a yellow residue on the cloth, regardless of the original color of the Bakelite, thereby verifying the plastic jewelry’s authenticity. Here are some great examples of Bakelite and Lucite jewelry (alas, we’re out of Celluloid) available through the Wearables department of Dogbotz Boneyard. to show off their plastic costume jewelry! Those of us who operate our own businesses do so because we believe that we have a set of products or services desired by consumers or clients, and if we judiciously meet these demands, we will be financially rewarded for our efforts. From the smallest entrepreneurial enterprises to the largest conglomerates, this is a (if not, the) primary component of our respective business missions. After all, few folks open a business with the ultimate aspiration of becoming bankrupt. This holds true for Dogbotz Boneyard, LLC. So, when I contemplate our subsequent six-fold mission statement, quite logically the first five points address our online business culture: high-quality resale products, the desire for environmental sustainability, education about vintage and collectible goods, excellent customer service, and an enjoyable online shopping experience. To select carefully high-quality items for each product category: Artwork, Furniture, Home Goods, Metalwork, Playthings, Wearables, and Etc. To serve as a retail venue for vintage, recycled, repurposed, sustainable, fair trade and collectible products for the continued well-being of Earth Mother and all her inhabitants. To educate and inform customers truthfully about the origin, maker and condition of each item, if known. To solicit customer feedback to improve presentation of goods, to modify product categories, and to provide excellent customer service. To offer a playful and enjoyable environment to customers as they shop online. To provide charitable support to the communities that we serve. Yet, the sixth bullet point has nothing to do with selling products or generating a profit. In fact, the final aspect of our business mission focuses on the converse; in this case, donating money for charitable purposes. In a world dominated by advocates for corporate greed, by practitioners of a scarcity mentality, and by conservative politicians renouncing altruism as the proverbial financial opiate of the masses, some of us, whether small business owners or senior leaders of large corporations, still strive to be good corporate citizens for the communities in which we do business. Cynics would say that we do this under the false pretense of portraying ourselves as beneficent so that those in our communities will be fooled into becoming loyal customers. “It’s all a marketing ploy,” nay-sayers decry. Well, I cannot, in truth, fully know the sacred or profane intent of other business owners or leaders when it comes to supporting charitable causes and organizations, but I can speak for my business and life partner, Dan Hartmann, and myself. We both came to embrace early in our lives the poignant yet undeniable reality that ours is a mortal journey and that at journey’s end neither of us wishes for a legacy that focuses merely on how many products we sold or how much profit we made, but rather on how we in a small way — or two or twelve — helped to enhance the well-being of Earth Mother and the welfare of the communities in which we thrived. And so, we decided to support community-based nonprofit organizations that promote the care of Earth Mother and her creatures with 10% of our profits (as our business grows, we aim to increase this percentage, too). 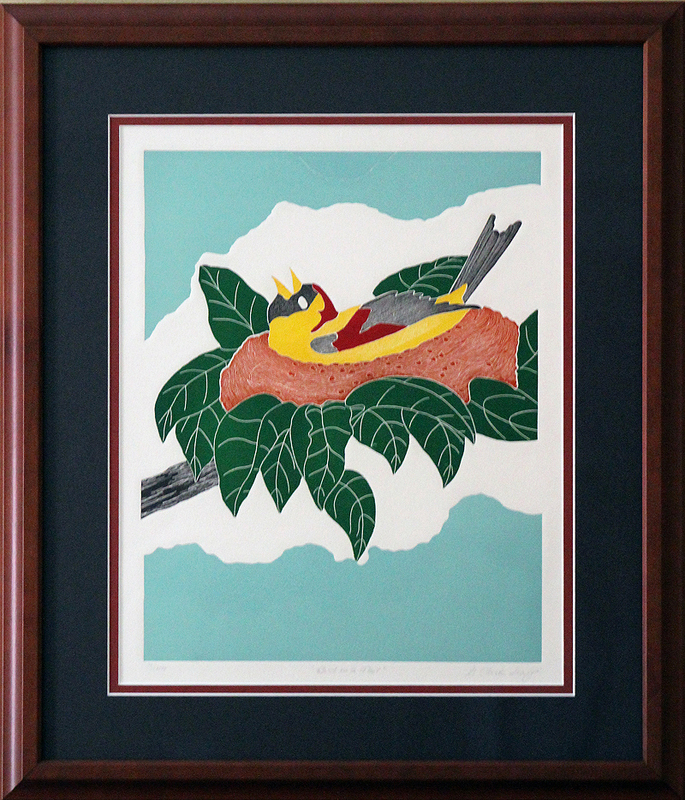 Environmental causes, wildlife rehabilitation centers, and animal shelters — these are the heirs of the joy and profit we receive in reselling artwork, vintage collectibles, and recycled or repurposed goods to others. After all, it has been our canine companions — Soot, Suds, Lucky, Drake, Blackjack and Mica, to name a few — who have in their unique ways taught us the unassailable qualities of companionship, playfulness, loyalty, alertness, devotion, protectiveness, unconditional love and how to find the humane in our own humanity. Their fundamental joy of being serves as the playful platform of our resale business Dogbotz Boneyard. During our initial months of business, Dogbotz Boneyard supported Fellow Mortals Wildlife Hospital, a nonprofit 501(c)(3) organization located in Lake Geneva, Wisconsin, committed to ethical, compassionate and professional wildlife rehabilitation. In part from our donation, the staff and interns of Fellow Mortals were able during the drought of spring and summer to rehabilitate literally hundreds of orphaned animals (songbirds, squirrels, goslings, ducklings, cottontails, opossum, and others) and return them to the wild, healthy and ready to make a home prior to winter’s first frosty breath. All this, and they even had time to conduct their second annual Wildlife Education Day! In the last fiscal quarter of 2012, Dogbotz Boneyard has selected to assist the Milwaukee Animal Rescue Center, a 501(c)(3) nonprofit no-kill shelter whose mission is to place homeless animals into loving, permanent homes as well as to provide community outreach programs in order to secure a better future for all companion animals. I was fortunate to recently visit the Milwaukee Animal Rescue Center and meet its executive director Amy Rowell and some of its feline residents. I was quite impressed that this organization, operating on only an annual $120,000 budget, has found creative responses to the threat of euthanasia and the challenge of overcrowding within humane societies, animal control agencies, and rescue groups throughout the entire state of Wisconsin by accepting animal transfers for care and placement, thereby saving the lives of hundreds of cats and dogs annually. In 2013, the Milwaukee Animal Rescue Center hopes to renovate a large shed/shortage space so that it can house dogs (which are currently kept with foster families until adopted) and serve as a meeting place. I have included some pictures I took while visiting the Milwaukee Animal Rescue Center. 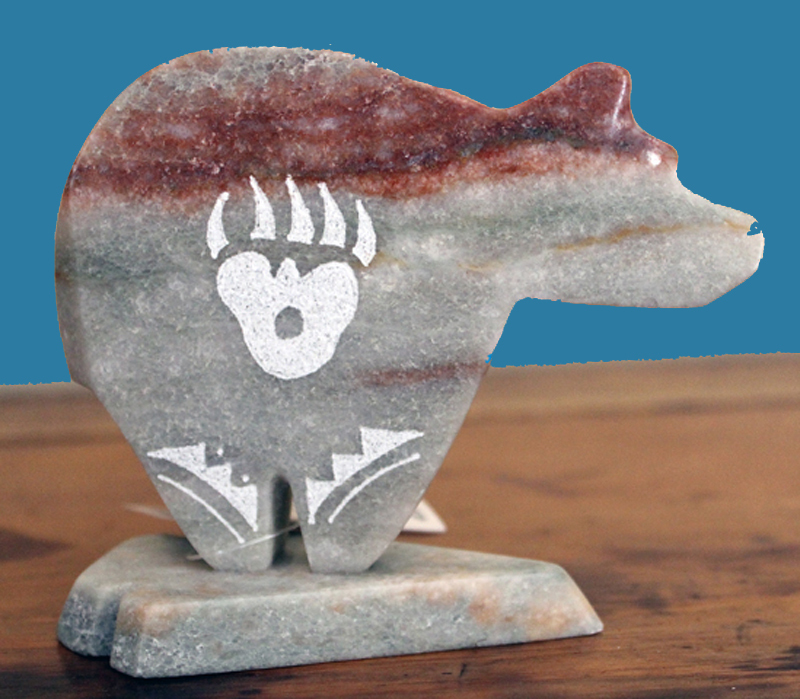 When we first considered presenting Native American artifacts as a special collection offered through Dogbotz Boneyard, we weren’t quite sure whether it was wise to include artwork, especially painting. 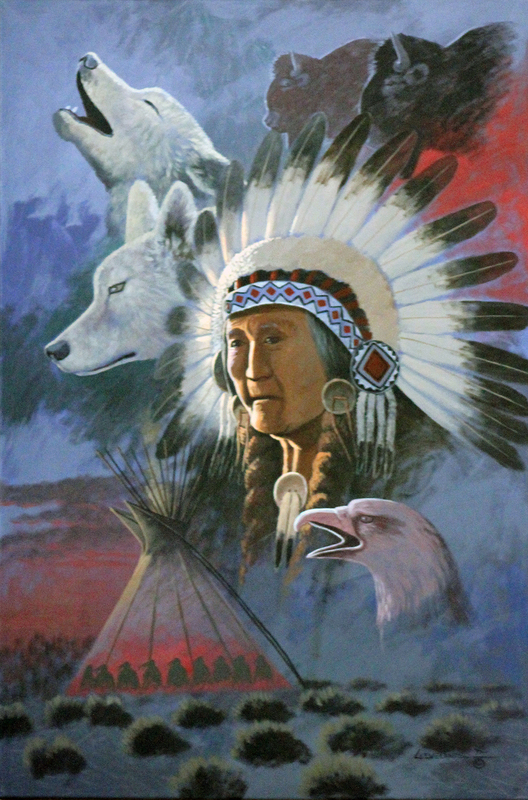 Though Native American painting remains a popular art form about which people have e-mailed us, painting, as it’s understood within the context of European art history, is not a traditional art form for most Native American cultures. Yes, native painting traditions exist in many tribes, but unlike their European counterparts, paintings were almost always used as decoration for apparel (for example, paintings on leather war shirts) or other functional items (tipi covers come readily to mind). Or, similar to their European cousins at Lascaux and other prehistoric sites, many North American indigenous paintings weren’t portable, such as petrogylphs on a nearby cliff face or other large rock formation. Before European contact, Native American painting was endowed with a variety of ritual and social purposes by diverse cultural groups throughout the continent. That said, perhaps the greatest example is Navajo sandpainting, which was originally created for religious ceremonies or for spiritual healing purposes. 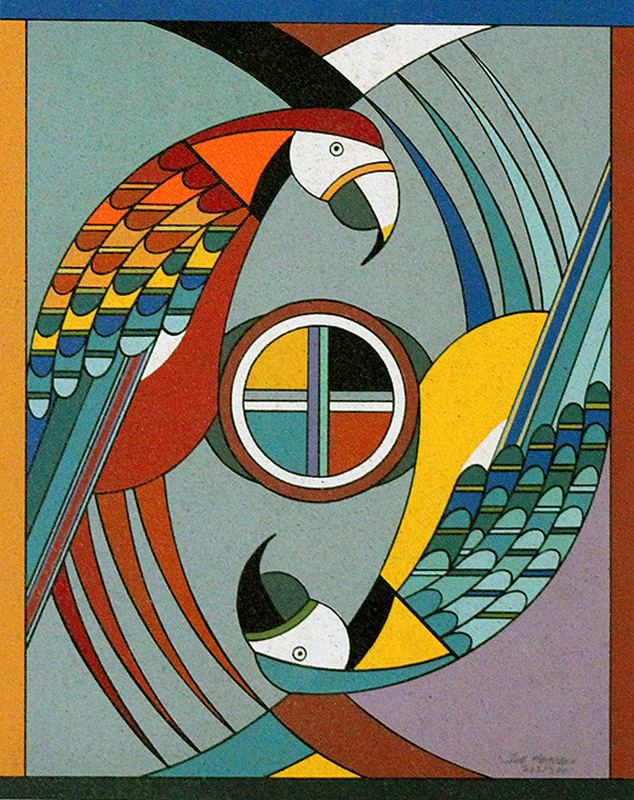 Today, some contemporary Navajo artists have designed secular versions of sandpaintings that can be acquired as cultural art. 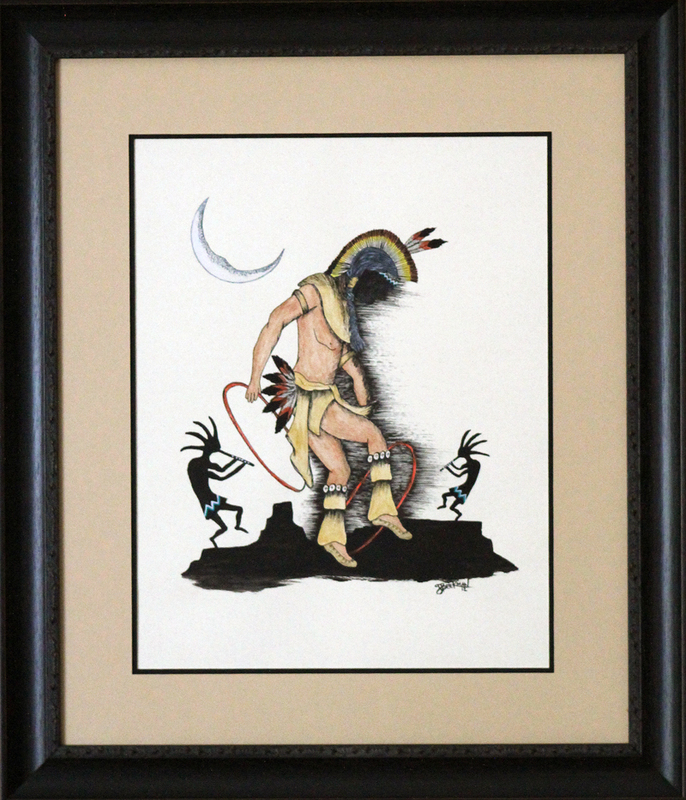 Many contemporary Native American artists have adapted Western European painting styles to portray the people of their own tribes as well as their tribal experiences and worldviews. Such artists strive to maintain the traditions and culture of their people and reflect the dynamic and sometimes painful changes that they and their respective cultures have endured. 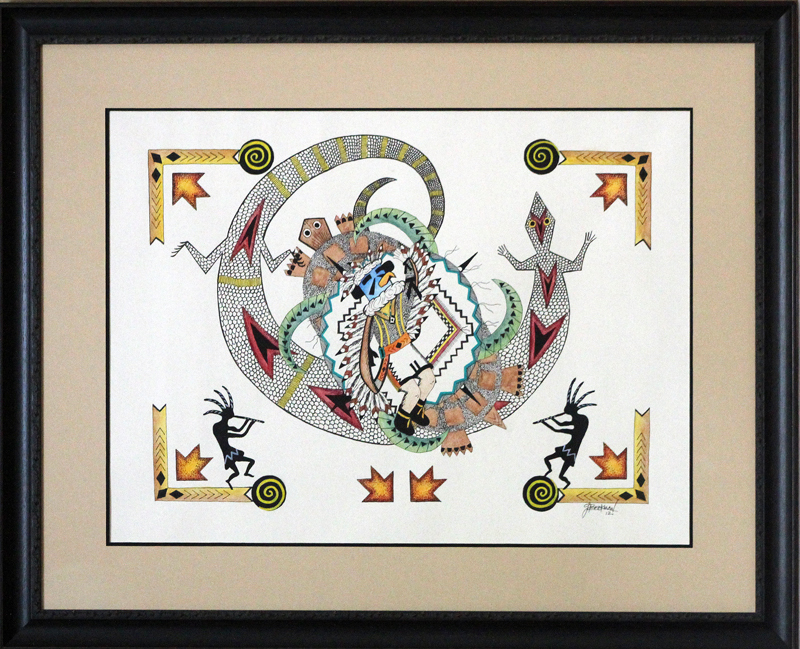 Though the techniques of these paintings are not traditionally Native American, the styles, designs, and subject matter reflect the artists’ tribal heritage, and many of them are stunningly beautiful and incisive. 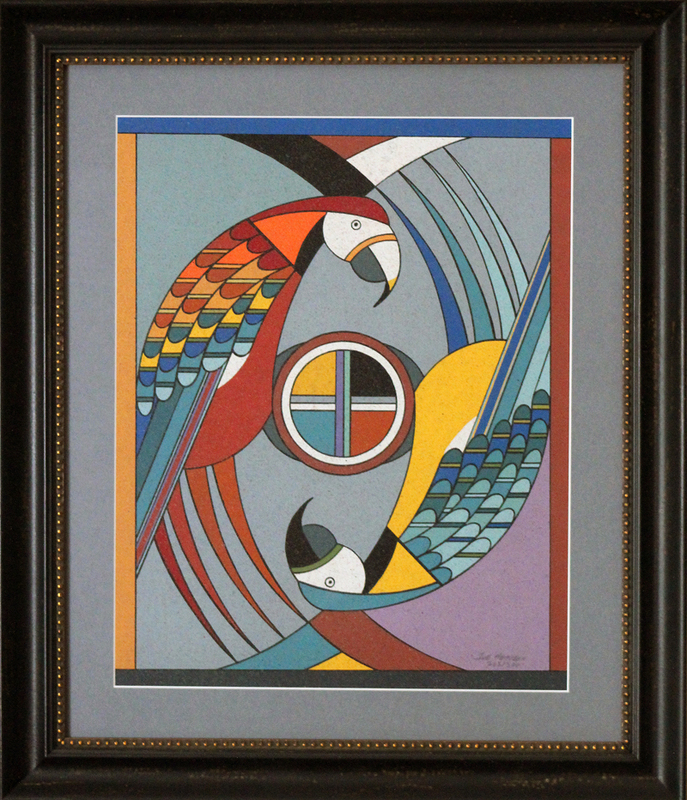 Consider Peyote Man or Fire Woman by Sioux artist Kathleeen Kills Thunder, Wisdom of Our Fathers by Navajo painter Fred Cleveland, and Anasazi Parrots by Cochiti artist Joe H. Herrera (see images below). 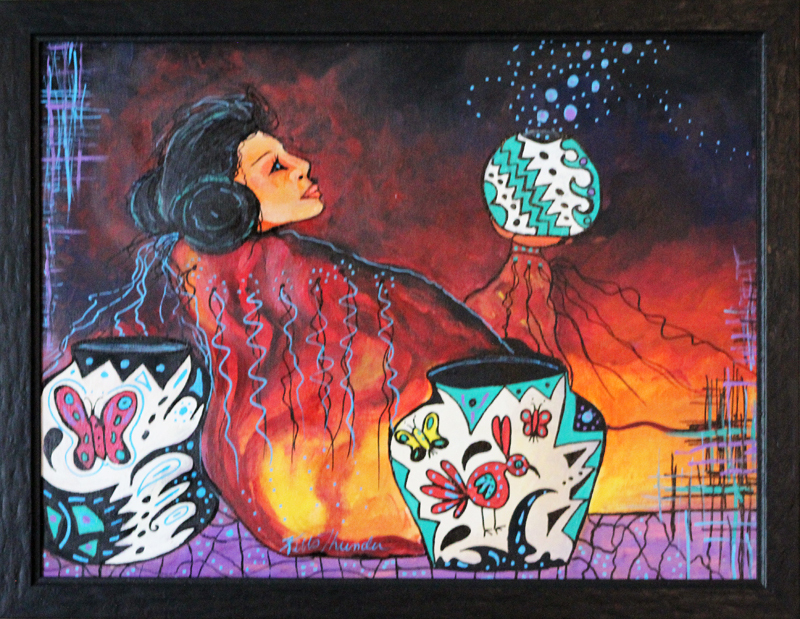 In addition, contemporary Native American artists cover the gamut of expression in all media, from the acrylics of Fred Cleveland to the digital artwork of French-Ojibwa artist Michael Pierre Price. And, that’s just in the field of painting, for similar diversity exists in the sculptural artwork of Six Nations sculptor Clifton Henry and Navajo ceramicist Tom Vail, Jr. 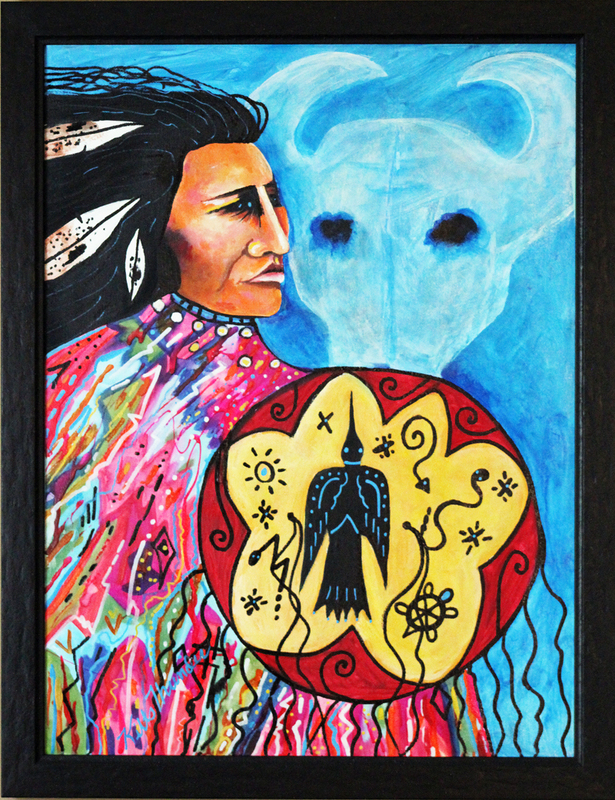 The challenges currently facing many contemporary Native American painters are the conflicts between the styles of purism and modernism and between paintings created by genuine Native Americans and those works produced by artists inspired by Native American culture. Thus, such questions as, “How much tribal cultural imagery must be maintained within a painting (or any media, for that matter) to be considered by collectors as genuinely Native American.” Or, “Can a painting of any subject matter in any style, regardless of its point of inspiration, be deemed Native American as long as the artist himself/herself is an officially, tribally registered individual?” To date, the debate on these topics continues to be discussed. “Standing Horse” by Tom Vail, Jr.